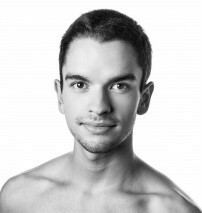 Luis Eduardo Gonzalez joined The Joffrey Ballet in 2015.Mr. Gonzalez is originally from Bogota, Colombia, where he grew up before moving to Atlanta, Georgia. From a very young age, his training came primarily from the continued direction of Maniya Barredo, former prima ballerina of Atlanta Ballet and current director of Metropolitan Ballet Theatre. Mr. Gonzalez has received the Star Student award at Regional Dance America’s SERBA, took third place at the Regional Youth American Grand Prix competition in 2008, first place pas de deux at the American Ballet Competition in 2013, and was selected to compete as the only representative of Colombia in the 2014 Jackson International Ballet Competition.